Moraea villosa (Ker Gawl.) Ker Gawl. The peacock moraea previously occurred in great abundance in the mass spring-flower displays of the Cape lowlands. Sadly, this attractive flower has lost more than 80% of its habitat to wheat fields and urban expansion, and only a few populations remain in isolated renosterveld fragments. Moraea villosa is a perennial cormous geophyte which grows up to 40 cm tall. Stems are soft and hairy. Plants have a single, narrow, hairy leaf which is attached near the base of the stem. The leaf is normally as long as, or often longer than the stem. Moraea villosa bears large showy flowers with a light sweet scent. The three large outer of subsp. villosa can be various shades of purple, lilac or pink. Subsp. elandsmontana has bright orange flowers. The inner edges of the outer tepals are marked by yellow nectar guides, which are bordered by broad conspicuous crescent-shaped bands of iridescent green, blue and navy, resembling the lustre of peacock feathers. The smaller inner tepals are three-lobed, the outer lobes are small and rounded, while the middle lobe is long and slender. The style is divided into three flattened branches resembling small petals terminating in paired crests. The anthers are attached to the underside of the style branches. Moraea villosa flowers between August and September and the flowers last several days. Small angular seeds are contained in cylindrical capsules. Moraea villosa subsp. villosa is classified as Vulnerable due to its restricted range, few remaining populations and declining habitat. Although a few large populations of several thousand plants remain, most populations consist of only a few plants confined to small, isolated habitat fragments. Populations on these small fragments, which are surrounded by crop fields, are threatened by a lack of fire (which stimulates flowering), loss of pollinators, pollution by pesticides and fertilizer, and invasion by alien plants, particularly grasses, which find favourable habitat in the fertilizer-enriched soil. Moraea villosa subsp. elandsmontana is also classified as Vulnerable, due to its small population size. Only one population of about 350 plants is known. This population is protected in the Elandsberg Private Nature Reserve, and is not otherwise affected by any threats. 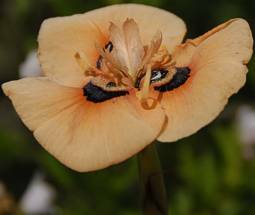 Moraea villosa is endemic to the Western Cape. Subsp. villosa occurs at low altitude (below 300 m) between Gordon's Bay, Ceres and Piketberg, although it is now largely extinct in the southern part of the range. Subsp. elandsmontana occurs in a small area at the foot of the Elandskloof Mountains near Gouda. Both subspecies occur in fynbos and renosterveld and prefer stony clay soils derived from shale and granite. Subsp. villosa is also sometimes found in sandy soils. The genus Moraea was first described as Morea in honour of the English botanist Robert More (1703-1780), but Linnaeus later changed the name to Moraea after the surname of his wife, Elisabeth Moraea and his father-in-law, Johan Moraeus (Goldblatt & Manning 2008). The genus consists of ± 195 species (Manning 2007) and occurs throughout sub-Saharan Africa, extending to the Middle East. Most species (173) are indigenous to South Africa, where they are concentrated in the winter-rainfall region. Moraea villosa is part of a group of Moraea species including Moraea aristata (CR), Moraea tulbaghensis (EN) and Moraea gigandra (EN) known as the 'peacock moraeas'. They share the characteristic of large iridescent markings on the outer tepals and are some of the most striking, but sadly also most threatened members of the genus. Moraea villosa is named for its hairy stems and leaves (villous meaning hairy or shaggy), the distinguishing feature of this species. It was discovered between 1772 and 1775 by the Swedish botanist Carl Peter Thunberg, a student of Linnaeus who is often called `the father of Cape botany' (Gunn & Codd 1981). Thunberg was one of the first European botanists to explore the Cape Flora, and during his three years at the Cape discovered more than 3000 new plant species. Subsp. elandsmontana was discovered by the botanical artist Fay Anderson in 1979. The painting of her discovery can be seen in the illustrated monograph of the genus by Peter Goldblatt (Goldblatt 1986). Moraea villosa is adapted to fire, which stimulates flowering in this species. Small habitat fragments however seldom burn, to the detriment of reproduction in this species. Grazing, which opens up vegetation, can also stimulate flowering. Moraea villosa is pollinated by monkey beetles. 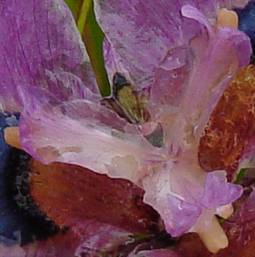 The beetles feed on nectar, which is located at the base of the tepals, as well as on pollen scattered across the large outer tepals. As the beetles move across the tepals pollen is brushed onto their hairy backs by the overhanging anthers. It is suggested that the beetles are attracted to the flowers by the iridescent peacock spots on the tepals, as the colour of these spots mimics the colour of the pollinating beetles, which may lure them with the promise of finding a mate (Steiner 1998). Monkey beetles are often observed mating on peacock moraea flowers. Many populations of Moraea villosa occur in areas that are too small to support viable populations of its pollinator, and loss of pollinators is contributing to the continuing decline of this species (Steiner 1998). Peacock moraeas are very attractive, and most species of this group, including Moraea villosa, have been introduced to cultivation, although they are seldom grown and not easily available in nurseries. Generally, the corms of some Moraea species were an important part of the diet of hunter-gatherer tribes, while others are poisonous to livestock (Manning 2007). Moraea villosa is easy to grow, and will make an attractive plant in a small garden or pot. Plants can be grown from either seeds or corms. Seeds germinate easily, but plants grown from seed may take up to two or three years to flower. Seeds or corms should be planted in well-drained soil in late March or April. Plant corms two to three times as deep as their diameter. Water sparingly, and avoid over-use of fertilizer. At the end of the flowering season, lift corms to prevent insect damage and rotting. Goldblatt, P. 1982. 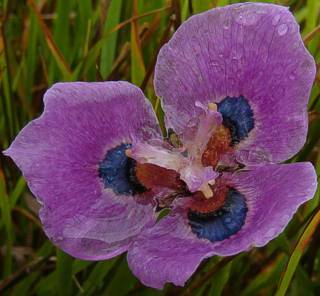 A synopsis of Moraea (Iridaceae) with new taxa, transfers, and notes. Annals of the Missouri Botanical Garden 69: 351-369. Goldblatt, P. 1986. The Moraeas of southern Africa. Annals of Kirstenbosch Botanic Gardens 14. National Botanic Gardens in association with the Missouri Botanical Garden, Cape Town. Goldblatt, P. & Manning, J.C. 2008. The Iris family: natural history & classification. Timber Press, Portland, Oregon. Steiner, K.E. 1998. Beetle pollination of peacock moraeas (Iridaceae) in South Africa. Plant Systematics and Evolution 209: 47-65.